I’ve been shaping and building boards for almost 50 years now. I started out shaping surfboards in 1968. I’ve shaped surfboards, windsurfboards, kiteboards and stand up boards and there isn’t another shaper on earth who’s had the same success in all of these different sports that I’ve had. Not only do I shape, but I can build any of these boards from start to finish, doing all the steps in the construction process. I don’t have a staff of “designers” in charge of putting out new shapes for each season. I do all of the prototypes and plugs for production myself. Many of my shapes are timeless. I don’t do “new” shapes each year for the sake of selling more boards. Some shapes in my line are not going to change. They will do what they’re made to do just as well today as they did when they were first introduced. Some shapes evolve but they don’t just disappear from the line because of the fact that I don’t do gimmick shapes just to get the publics attention and fool you into thinking I’ve got something that’s going to make everything else on the market obsolete. My shaping style is to do functional designs, and that involves a flow and blend of all the curves and contours of the shape. Those being the outline, the rocker line, the deck line and thickness flow, the bottom shape, the deck shape and the rail shape. When all these curves blend and flow together you get the GOLDEN RATIO and I’ve been able to come up with that GOLDEN RATIO a lot more often than most other board makers. 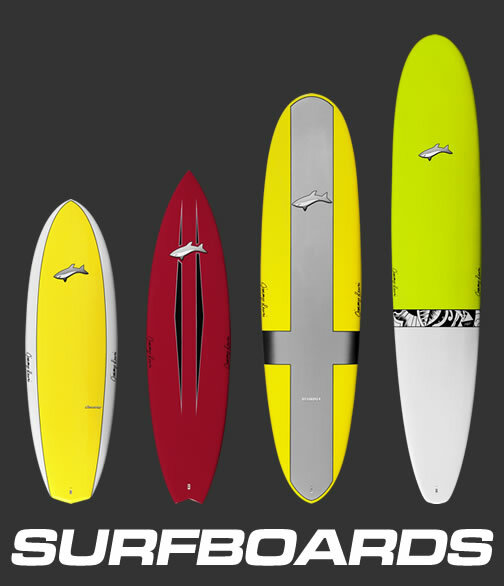 All of these shape factors determine not only how a board goes through the water, whether it’s riding on a wave or cruising across a lake or plowing through choppy waters..
My boards , whether they are surf, kite or stand up, fit on the water more naturally and with less effort of the rider than many other brands’ boards because of that GOLDEN RATIO that I get in each and every one of my shapes. I first started playing around with foam, fiberglass and resin when I was 11-12 years old and in the 6th grade. This was in 1962-63. 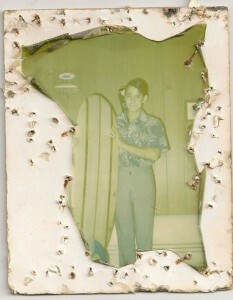 My oldest brother, John, who was 14-15 years old at the time had just gotten into surfing. So naturally my other older brother Dave and myself got into it too. I don’t know why making surfboards interested me at that time but somehow or another, I can’t remember, I got ahold of a small piece of foam and some fiberglass and resin, most likely from the “hobby shop” as they were called back then, and made a little scale surfboard that was about 10” long. I cut out one of the top brands’ logos from one of John’s Surfer Magazines and put it on under the glass to make it more authentic looking. I made two of those since the first one turned out so well. Next year I was going into 7th grade and in 7th grade the students could take wood shop and my plan was to make myself a belly board (boogie board) out of wood that year. To my surprise, the shop teacher told me that it would be much too big of a project for a 7th grader and that I had to wait until 9th grade to make something that size. So for the next two years, through 7th and 8th grade all I could think about was surfing and getting to 9th grade so I could make that belly board. I made it (glued up the wood and shaped it) during the first semester of school that year (late 1965) and took it home and glassed it during the Christmas vacation. In the late summer of 1967 we moved to Berkeley in northern California (we were living in southern California at the time) and I assumed that my surfing career would be over because of how cold it was up there. I quickly found that it wasn’t THAT cold and I also met a few surfers at Berkeley High. We started making trips to Santa Cruz and over to a spot called Bolinas which is north of the Golden Gate Bridge. On one trip over to Bolinas sometime in 1968 I saw this home made “short board” which at the time was anything shorter than a “longboard.” I took a few looks at it and said to myself “I could do that.” So I took my mom’s car down to Santa Cruz not long after that and bought a blank (surfboard foam), a gallon of resin and a few yards of fiberglass from O’Neil Surf Shop (O’Neil used to make boards too) and came back and turned one of the bedrooms in our apartment into my shaping room. 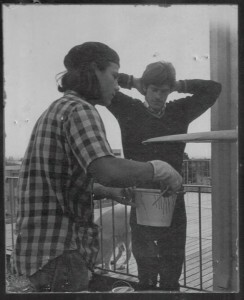 I glassed the board out on the roof and my surfboard making career was on it’s way! 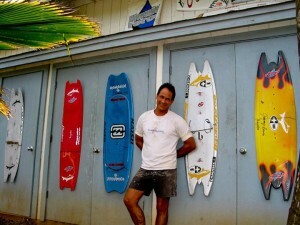 After high school I moved to Maui and for the next 10 years I was fully involved in making surfboards! I would shape, glass, sand, and finish each board I made as well as did a lot of glassing for other shapers so I became equally proficient in doing all of the construction techniques that are required in board construction. Around 1978 a guy named Mike Waltze came by the shop I was working at on Maui to see if we could make him something called a “windsurfer.” So I shaped him a board that was about 12’ long and that was my introduction to making windsurfers. 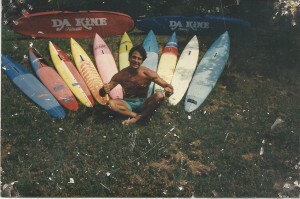 Around 1980 or ’81 Mike Waltze, along with BK (Bill King) and Fred Haywood started Sailboards Maui, the first windsurf shop on Maui and I got a job with them as their board builder. Things went NUTS at that time as the sport of windsurfing exploded around the world. Maui quickly became the mecca of windsurfing because of the perfect angle of tradewinds and the consistant surf on the north shore here. For the next 10-12 years I made only windsurfboards and I was so into windsurfing myself, I hardly made any surfboards and probably didn’t surf much either. During this period one of the highest points of my windsurfing days was when Fred Haywood took a special speed board to Weymouth England in 1983 and broke the windsurfing speed record on that board. This feat of Fred’s immediately rocketed him, Sailboards Maui, Maui Sails (who made the sail he used) and myself into world renown. In the following years my boards went on to break more records including the world absolute speed sailing record two times. The first time was when Pascal Maka, Erik Beale, Fred Haywood and myself too, sailed faster than the boat that held the existing world absolute speed sailing record at the time. A few years later, Erik Beale became the first one ever to sail over 40 knots on a 500 meter course. Around about this time I was introduced to a windsurf company called Kinetic. I was brought into that company as the shaper. 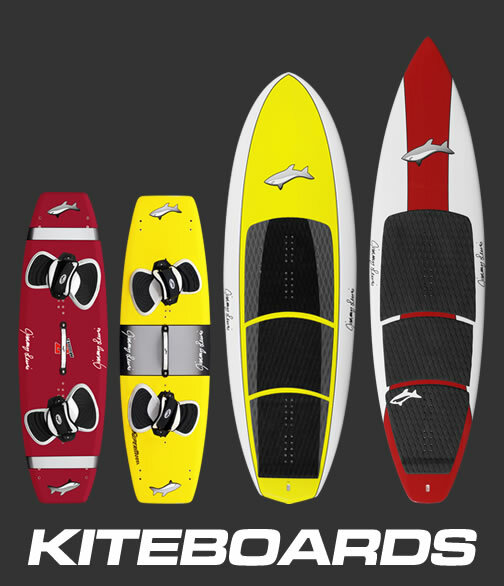 It was a relatively small company in comparison to the major brands but Kinetic made EXCELLENT quality boards. During the early 90’s I was getting a little bored with windsurfing and by the mid ‘90s I was back shaping surfboards along with windsurfers as well as surfing more. Then came kiting! 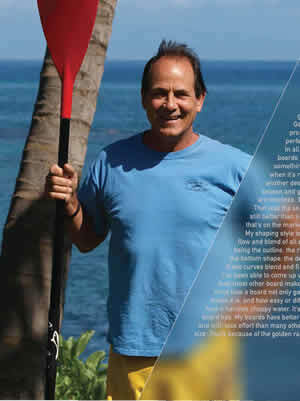 Lou Wainman had moved to Maui and him and Elliot Leboe made the kiteboarding statement heard around the world. Fortunately for me, they enlisted me as their shaper of custom kiteboards. As with my association with Mike Waltze and Fred Haywood with windsurfing, and becoming world known by the boards I was making those two and for many more, things worked out the same with my association with Lou and Elliot. I slid into world renown for the boards I was making and what they and others were doing on boards that I made. Around 2003 or 2004, my custom kiteboard business was booming and I couldn’t keep up with my demand so I contacted James Chen of Kinetic to see if I could get him to make kiteboards for me. We started working together with Kinetic making my kiteboards and within two years I started having him make some surfboards from my shapes. My assossiation with Kinetic was in full bloom again! About 5-6 years into the kiting career, around 2006 or so, stand up surfing became popular and, as we know, the rest is history. It is still growing today. Kinetic is making all of my boards, kiteboards, surfboards and stand up boards and the future is going to be better than ever because of that association.